Happy Monday! We finally had cooler weather here in Dallas this weekend, which was so exciting. 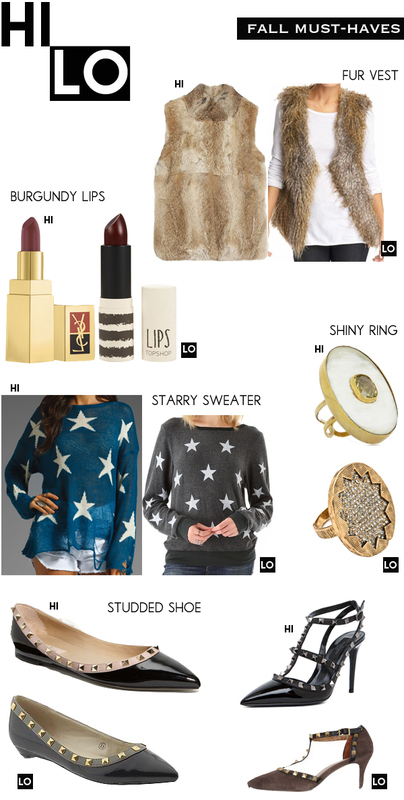 This change in weather got me thinking of some other fall must haves and so I gathered some high and low options for you. First off- the fur vest, cozy and chic. Just add to jeans and a t-shirt and you have yourself an exciting fall look. Also the burgundy lip is a must for fall. I think a shiny ring is good for any season. I love both of these and think a little sparkle in your hand will just make you happy all over. And the studded shoe, its classic and really works year-round. Which is your favorite fall must have? Thank god I already have a fur vest to fulfill part of our must have list! Phew! Love everything else you are crushing! Fabulous picks! Love a (faux)fur vest and those Valentino's are just gorgeous! I love the fur vest (must get one for fall & winter) and love the studded heels that you found! I want a fur vest SO badly! Love these picks. I want those studded flats so badly!! Buena selección, me encantan los pintalabios y los anillos! I think your cooler weather is headed for us later this week. Right now we're at the rainy part. Love the starry sweaters! All of your picks are fantastic, of course! It's so happy here in Dallas when we get that first chill in the air! These picks are perfect for fall. I love that you incorporated the two price points - really helpful when you love something but can't necessarily spend the money on it! It seems like fall is on everyone's mind!! Can't wait to start bringing out the warmer clothing. A fur vest is def on my list of things to buy! the sweaters are so cool ! I've been thinking about a big fur vest for a few weeks now. I wish I had a "style Dana" fund!! Happy you guys finally got a little breather form that terrible heat... Nice picks! great round up! I love the fur vests, I think I actually like the 'low' one better! I especially love the burgundy lips and studded shoes. Fall is in the air! Great hi lo picks - love the fur vest! Love the shiny ring + the fur vest...great picks! oh my gosh, i've been looking for a cheaper alternative to the valentino shoes for a year now!! so excited you found such a great one! Great!! I already have a fur vest!! Good to know is a must for this fall and the shoes!! Love them. Oh great I already have a fur vest as a must have for this season. Love the shoes!! You really give us lots of options, with different price range. id really like a faux fur vest like the one on the right. SO cute!